How I’m currently feeling: Glad that we got all of our shopping down in time!! I think Ginny Weasley from the Harry Potter series and Gale Hawthorne from the Hunger Games would make a great team. They both possess determination and strength. They both will fight to the death to protect their families. What book should be taught in school at any grade level of choice? How I’m currently feeling: Contemplative and snuggly. My answer actually surprised me. I thought of Harry Potter and Hunger Games or some other typical answer for myself because I’m in a typical answer rut, but then I remembered this book. Calico Captive is historical fiction based on the real journal entries of Susanna Willard Johnson about the kidnapping of her family and herself by a tribe during a raid in 1754. I believe it would work well in 5th grade because that is when I remember Social Studies focusing on American history, so it would tie in well with what the students were already learning. Describe how you would organize your library. I agree wholeheartedly with Enna Isilee! I organize by author, then alphabetically if it’s a stand-alone story or chronologically if it’s part of a series–and the series name is in alphabetical order with the other books by the same author. Keeping myself anonymous on this blog, I used screen name that I use for comments–and I wish it weren’t what it is, but oh well! It's almost like it did that on purpose. How I’m currently feeling: Still excited! The balls are about to begin! And I seriously doubt I’ll read 5 books during this challenge, but I’m really closing in on the 1,000 page goal! I want to say various bits from Ella Enchanted because I love the playful sentences Levine uses, but since I’ve read it every year since 5th grade the jokes are more amusing than make-you-want-to-chuckle-and-immediately-share. So instead I’ll reference The Fire Eternal by Chris D’Lacey in which a clay dragon pulls out a tool from his tool box: “He raised an eye ridge at the tool that settled in his hand. It looked very similar to the screwdriver used by the time-traveling hero of the dragons’ favorite television program.” Here the author is referencing “Doctor Who” a well known British scifi drama series. The book was published in 2007, so they are probably referring to the 10th Doctor as portrayed by David Tennant. Oh and here is a clickable link for that! Silly me! If you could live in any literary world, which would it be? How I’m currently feeling: Really glad that the series got better, because I got them at a Buy 4, Get 1 Free sale and after the slow, boring first book I was worried that I had thrown money away. I immediately thought “Harry Potter” when I read the challenge, but there is no promise that I would have magic in my blood. I would probably just end up an ignorant and unassuming muggle. So instead I would love to live in Narnia. The biggest appeal for me is 1. Talking Beasts (I love animals–sometimes more than people–and would love to hear what they have to say.) 2. Mythological creatures such as dryads, centaurs, and fauns actually exist. They aren’t a myth there. 3. I’d get to wear beautiful medieval clothing..or be born in a low station and see the beautiful clothing on the nobles. Nobles these days wear pant suits–practical, but boring. What did you think of the updates? Too close together? Didn’t like the time limit? I thought the updates were really well paced and it kept me on my toes while allowing me to get enveloped by the book I was reading. Would you participate in another read-a-thon hosted by Squeaky Books? Why or why not? Absolutely! This was my first read-a-thon and I loved it!! Any last comments on the read-a-thon? Can it not be annual and be more like semi-annual (like Victoria’s Secret in that they have a lot of semi-annual sales)? How I’m currently feeling: So glad I participated! 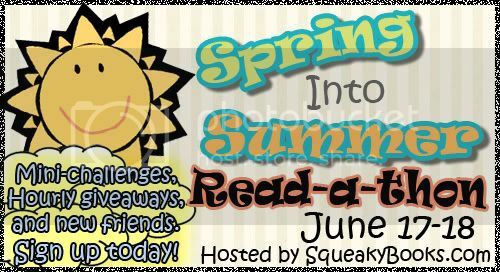 This post is to announce to the world that I’m participating in the Spring into Summer read-a-thon hosted by Enna Isilee of Squeaky Books! This read-a-thon is going to be so great! It’s two days where you try do NOTHING but read. It’s a great chance to get rid of some of those books that have been sitting on your TBR pile forever. But that’s not all! There will also be awesome mini-challenges and a TON of giveaways! In fact, just for signing up you are entered to win a $25 gift card to Amazon! SO GO SIGN UP! And if you say that These Pages Are Not For You sent you, you’ll get 5 extra entries to win that gift card! CLICK HERE to enter to win, and know all there is to know about the read-a-thon.